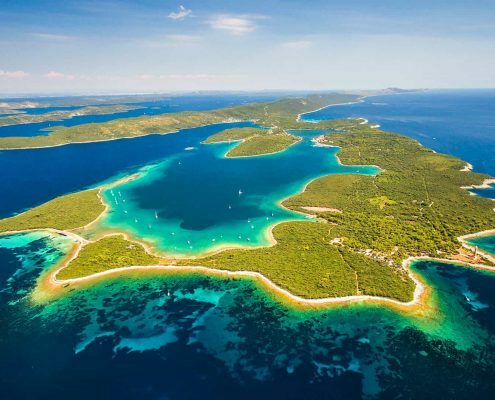 First time cruising Croatia – essential facts for travelers! 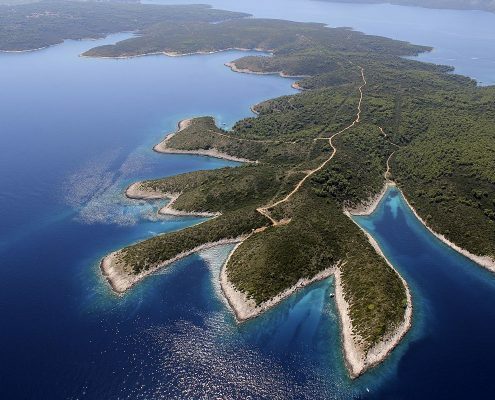 Croatia is one of the most popular gulet cruise destinations among our clients, but also among tourist in general. However, that being said isn’t the reason that will make you jump on board straight away. 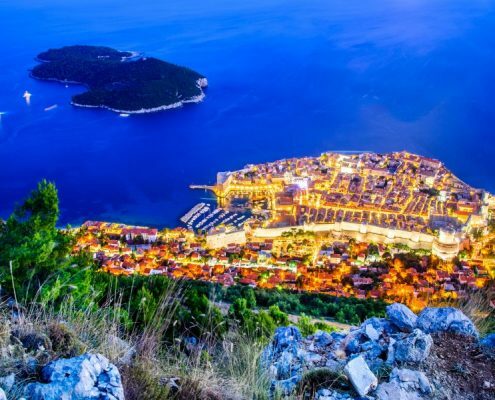 Here are 14 facts you should know before deciding whether a cruise in Croatia is the right choice for you! 1. Which Cruise areas are the best and for whom? This is an excellent route for those who want to stay Active and on-the-go. You’ll get a chance to explore and go out of the gulet every now or then, enjoy in nature, beaches, swimming and water sports. But you’ll also be able to relax and unwind. This is a fabulous route that can be adapted for those who like to relax and unwind. But it can also be great for those who want to stay active and who love to occasionally love to go on dinner, enjoy jet-set places, buy some souvenirs, or in general don’t mind being “a tourist” from time to time. This is a nice option if you like culture and beyond fascinating ancient towns. There is a lot of room for exploration because there are many historic sites, interesting architecture, culture, beautiful nature and more. Find out more about destinations and possible routes that could be the right choice for you! 2. How’s food in Croatia? Will I be able to eat only on the ship, or I can eat in local restaurants? It’s safe to say, that Croatian food will not leave you unsatisfied. All regions in Croatia has its own specialities. 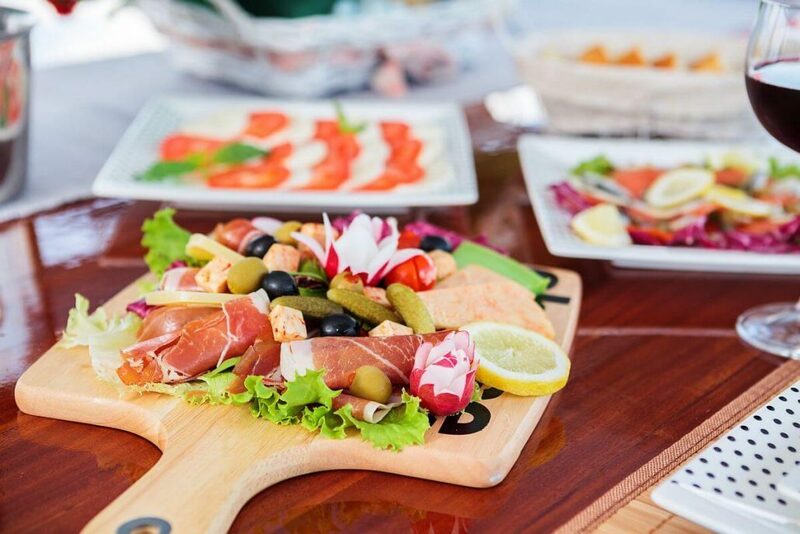 In Coastal Croatia Mediterranean cuisine is dominant and it is famous for its fish dishes infused with olive oil, herbs and spices of local production. However, meat dishes are also popular like for example lamb dishes, prosciutto and other types of meat. An unavoidable thing that accompanies these dishes are distinctive traditionally made Croatian wines that aren’t as popular in the world as they really should be. You can in advance decide whether you want the half board (breakfast and lunch) or you want full board (breakfast, lunch, dinner). In half board 270€ to 400€ per person per week, you have the option every day to go out and eat in local top quality restaurants and experience the new local cuisine. You can find reasonably priced restaurants, but that takes your additional planning and for those who have a tight budget then this could be a bad option. 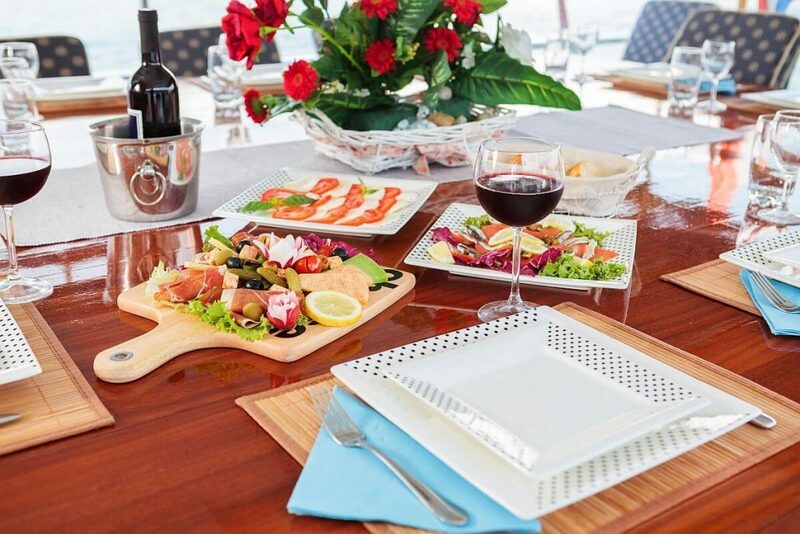 In Full board from 370€ to 460€ per person per week, all of the dishes are prepared and served on board by experienced personal Chef. This way you will save money, and you have the option to choose menus and state your food preferences and expectations in advance. 3. Drinks on a ship during the Cruise? Drinks in Croatia in general? When it comes to buying drinks in Croatia, the good news is that local supermarkets have an amazingly big range of any kind of drinks you can imagine. And even better is that you can find them for affordable prices. However, not so good news is that 95% of ships in Croatia do not allow you to bring your own drinks on board with you. You must buy drinks from the ship bar that is usually a bit cheaper than regular bars in town. Word of advice is that you keep track of how much you drink because you order your drinks throughout your cruise and you pay the bills at the end of your cruise. Drink smartly! 4. Can you leave the ship every day? When and where? The answer is yes, you’ll always have a possibility of leaving a boat in some way, here is a general short summary of a day on the gulet. You could stay in the city harbour and explore the town after the breakfast, or you could jump straight to the sea after waking up! If not that one some days you’ll be cruising to a new place or nice bay in early morning hours. There are many things to do. This time is usually reserved for relaxation after appetizing lunch. You can use this time for fun swimming, relaxing on the deck, sunbathing, reading your favourite book. If you are feeling more adventurous you can take part in some water sports that boat provides. As the sun goes down you can decide if you want to stay on the ship or you can go out and explore the nightlife. Everything is very flexible on the cruise, however, you have to make sure that you state your preferences before you book. 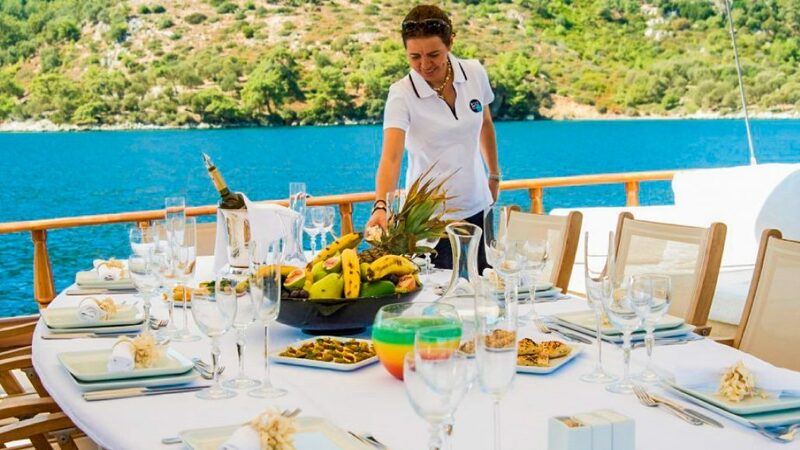 Your experience highly depends on the itinerary you take and the gulet you book. 5. 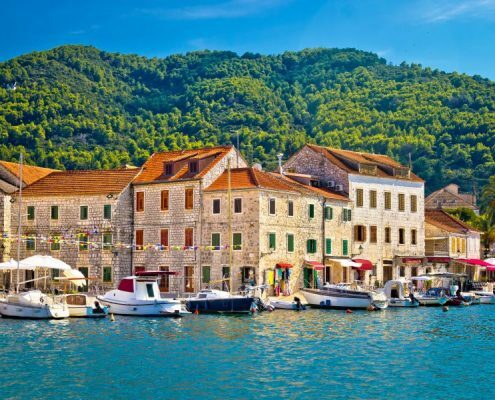 Is Croatia a good place for a family cruise? What is it like for party groups? Is it a good choice for seniors or couples who wish to see sight the most? 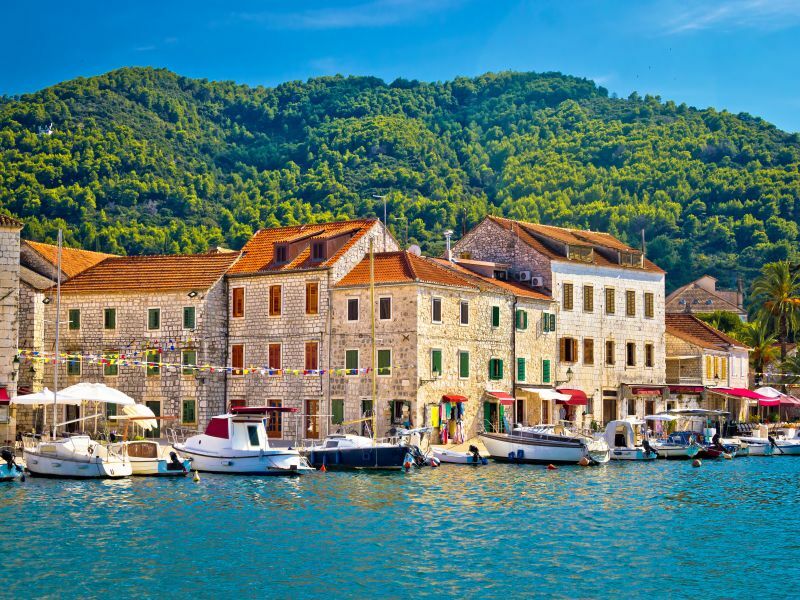 Croatia is actually a great place for a family cruise. 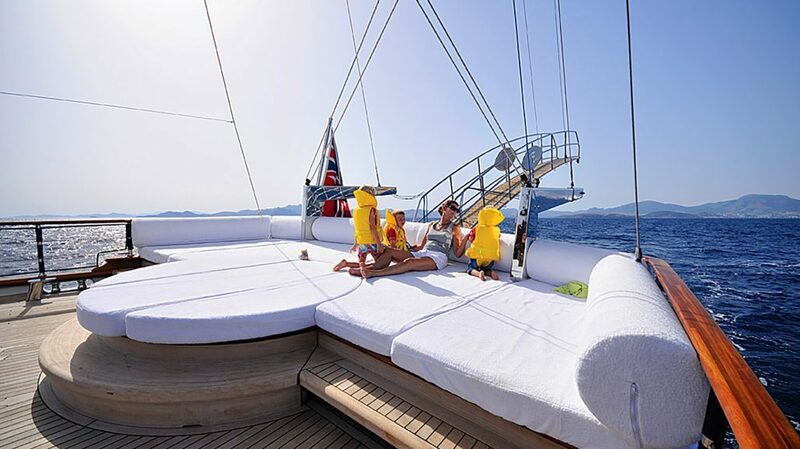 We will make sure to match you with gulet that includes a safety net so your child can play carefree. English speaking, friendly and patient crew is important but they are not there to watch over your kids 24-7. For help around watching over kids you can if you want, rent a babysitter during the cruise. Cruise for couples with no children and active seniors have few things in common. First one being, there are no kids on this cruise. Second is that you can pick routes that offer a huge amount of extra activities and time for exploring. 6. Is Croatia safe in general? What about Sea? Are there any sharks? Adriatic sea is very safe without any praying and dangerous sharks, killer medusas or piranhas. Those things you can see in some horror movie but not in Croatia waters. 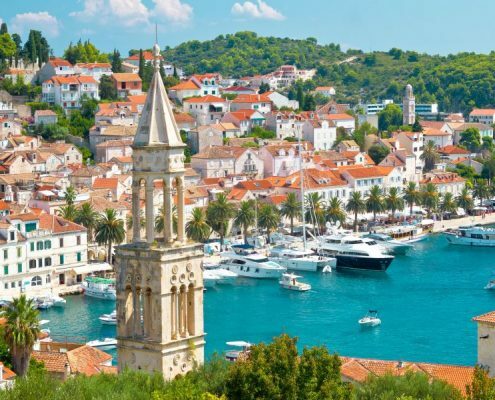 Speaking in general, Croatia is also known as a destination that is extremely safe for travel. So relax and don’t worry about safety. 7. 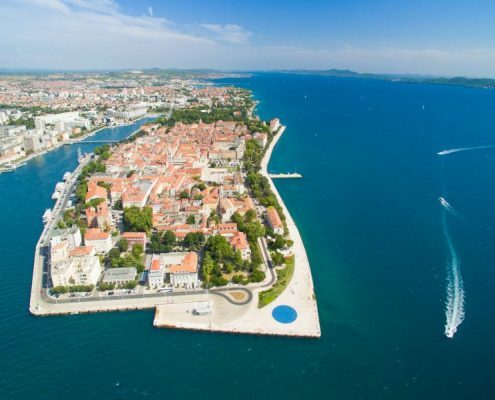 What should I pack for Croatia cruise? Are there any dress codes? On gulets or motor sailors, you must know that the atmosphere is always very relaxed and fun. There is no dress code and you can leave your tie and evening dress at home for some other events. Shorts, T-shirts, summer dresses and casual look is the way to go! What you absolutely must remember to bring is a swimsuit. 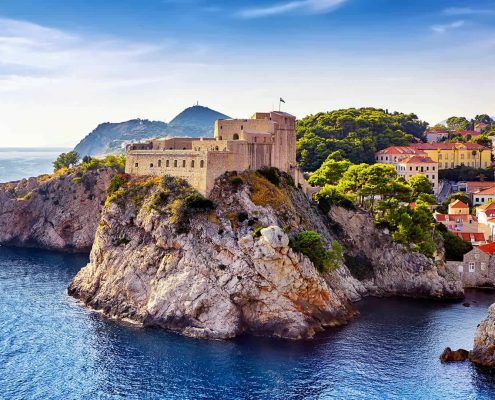 For Croatia, cruise pack change of clothes, camera, phone and such stuff, cash and credit card, swimwear, personal toiletries, kids’ stuff, medications, passport ID, cruise documents and you are ready to go! 8. Prices of food & drinks on ships VS Croatia in general? 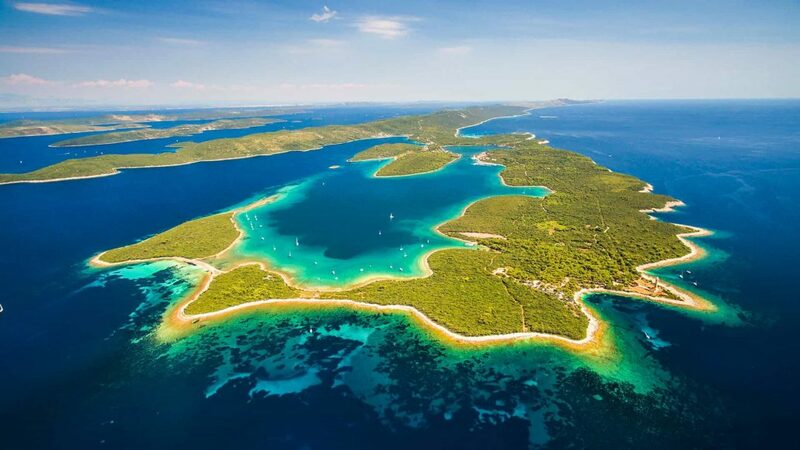 Croatia is somewhere in middle ground, it is not a cheap destination but it is also not crazily expensive that your head will spin. For example, a local beer in a supermarket will cost you around €1 or less, in some fancier bars and some fancier beers can go up to maximum €5. If you are not a beer drinker and this means nothing to you here is one more example. A scoop of ice cream ranges from €1 to €1.5 so you and your kids can enjoy in endless amounts of ice cream for an affordable price! A nice dinner in a local restaurant will cost you between €10 to €25 per person depending if you go to high-end restaurants, or not. Ship prices for drinks are similar to those in town bars but this again depends on the gulet you book. But you have to pay for a corkage fee that can range from 600€ to 1200€. 9. 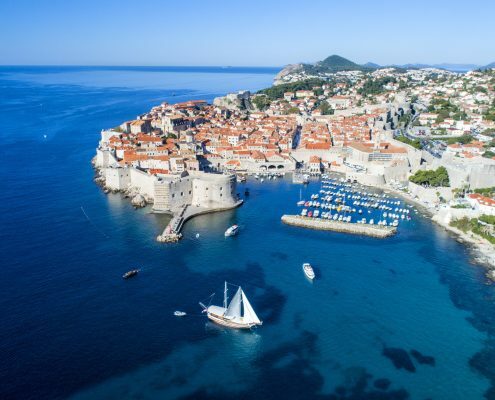 What are the prices of cruises in Croatia? 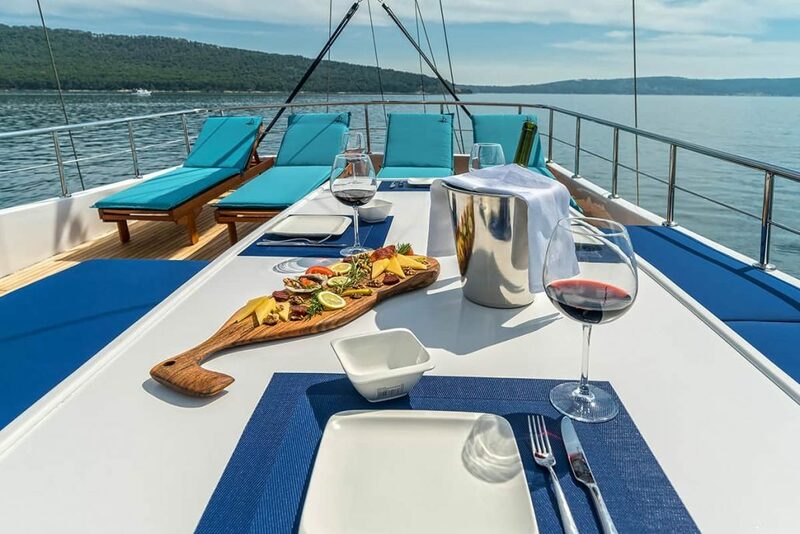 Croatia Cruises costs depend on many factors, a category of gulet, the season you picked, extra amenities, and so on… It can cost you anywhere from €400 per person per week to €2.500 per person per week. 10. 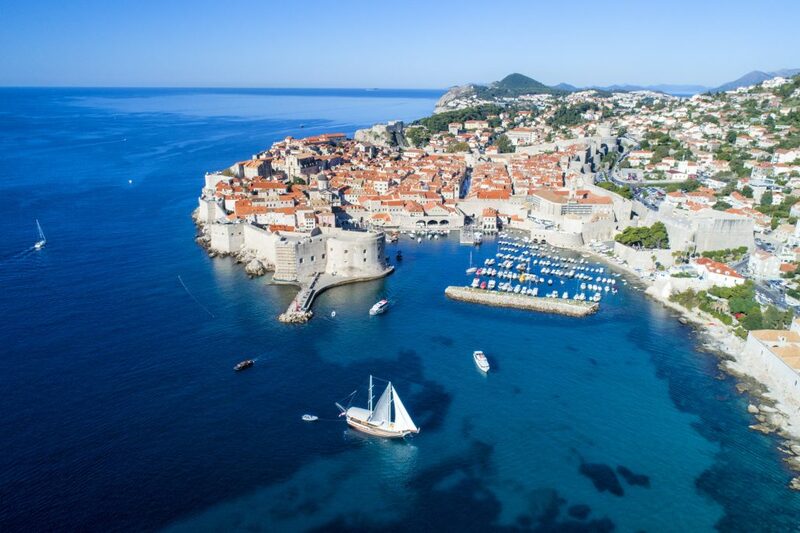 How can you get a good deal on a Cruise in Croatia? There are a few ways you can get the best value for your money. if you decide to book early you have all the best ships available! Those are gulets with the best professional crew, amazing services, and ships are very well maintained and offer great food. You will get a discount that is only a bit smaller than booking last minute, but booking last minute has its own disadvantages and advantages. Best case scenario, with booking last minute you can get really good deals and amazing boats. 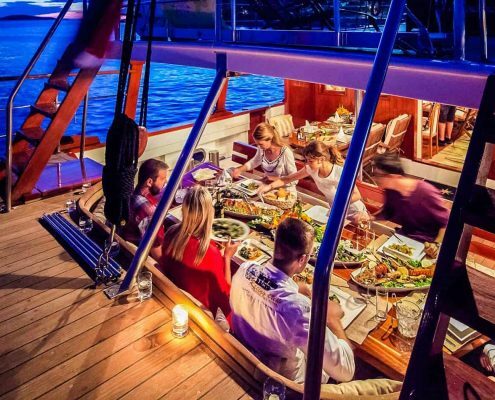 The worst-case scenario would be you getting an amazing deal on gulet and then you have problems during the cruise whether with service, food quality or something else. Or it may happen that you will not be able to book anything since everything will already be full. 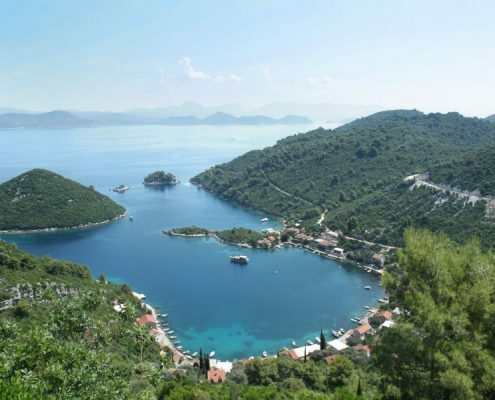 Croatia has only around 50 gulets for charter so there is less flexibility for private charter. 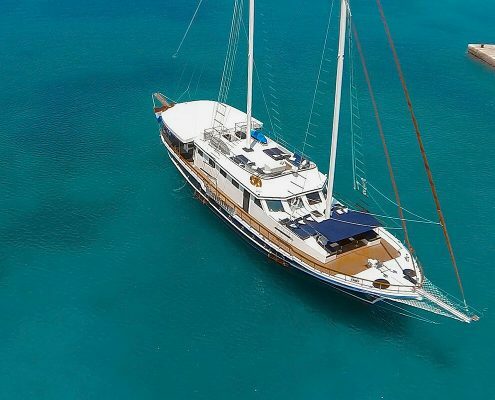 For bigger groups (around 34-40 guests) you also have around 100 motor sailors to choose from but they are mostly booked quickly and discounts are not an option most of the time. 11. When is the best time to travel to Croatia and why? is the low season and more affordable time. Temperatures are around 20-25 degrees Celsius and the sea will be less than 20°C. You can’t swim around comfortably in such temperature unless you are very brave and used to cold. However, these moths are perfect for biking, hiking, sightseeing and checking out towns and ports. Any sports enthusiasts or those who ate not that keen on swimming will love the advantages these months bring! is mid-season. Temperatures can go up to high and hot 30 C. The sea temperature is still a bit fresh and chilly once you first dip your feet in it but it is okay for swimming. A big advantage of these months is the possibility of avoiding heavy crowds, but you won’t be bored! The cities and islands are lively and bars and restaurants are getting busier. is, of course, the high season. This is the best time if you want to experience good weather and a warm gorgeous sea. 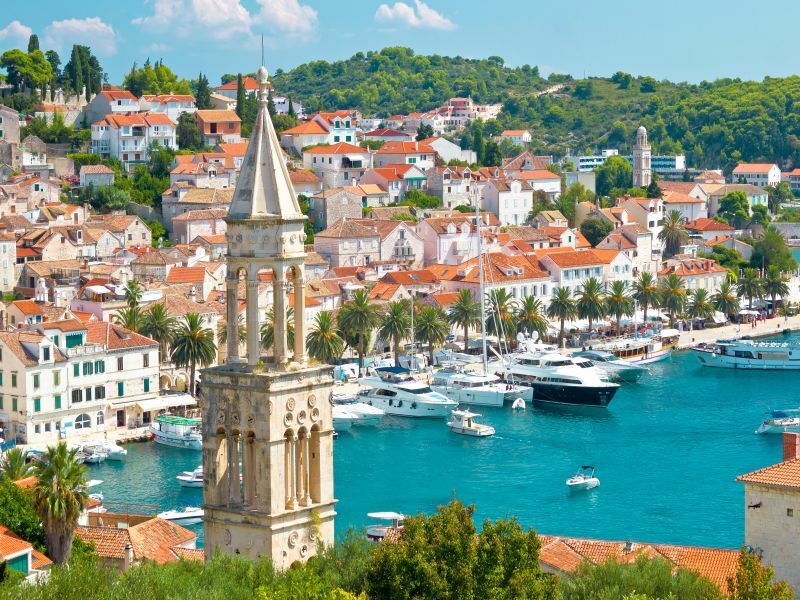 Some places such as Hvar, Dubrovnik, Split, Brač, and Mljet can get very crowded during this time. But there are still options to avoid this as much as possible by planning early! 12. Does the crew speak English on board? English is usually more or less spoken on board most of the time. The absolute minimum will allow you to always be able to communicate things with the crew in English. The crew sometimes also speak Italian, French or Spanish, but make sure to double check this before making a reservation. 13. What kind of Cruise ships can you book and how is each of them special? 14. 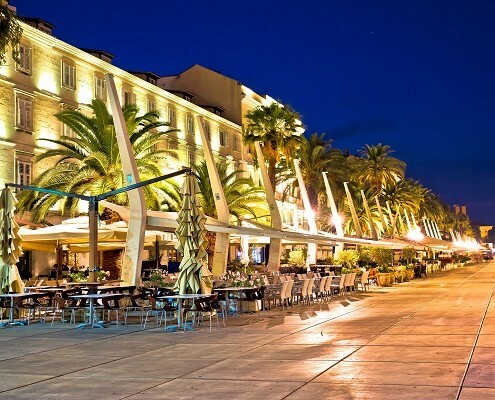 What is the most important thing on a Croatian Cruise? a) The first thing no matter what you do and before you plan, know WHAT YOU WANT! 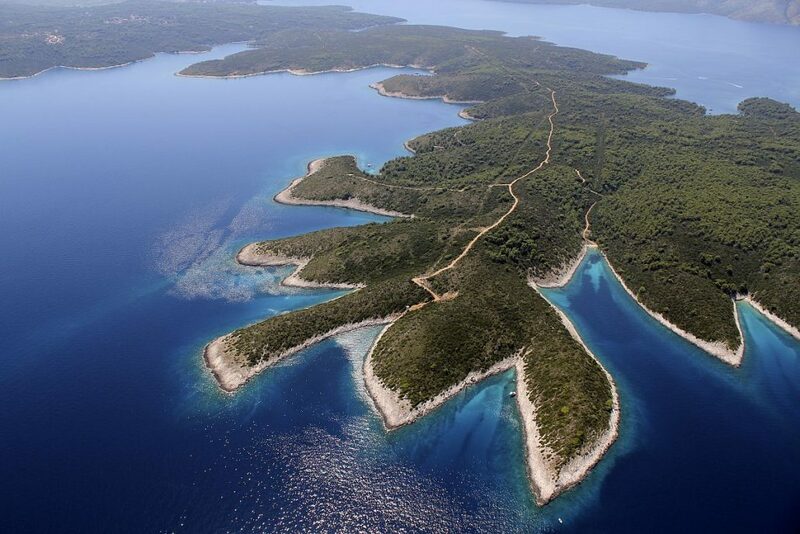 Croatia coastline truly has a natural captivating beauty and you can decide if you prefer visiting towns or being in nature? Do you like to party or a more peaceful atmosphere and some wine tasting? Would you like to cruise with your small children or you have teenagers? Contact us and tell us your wishes and preferences! 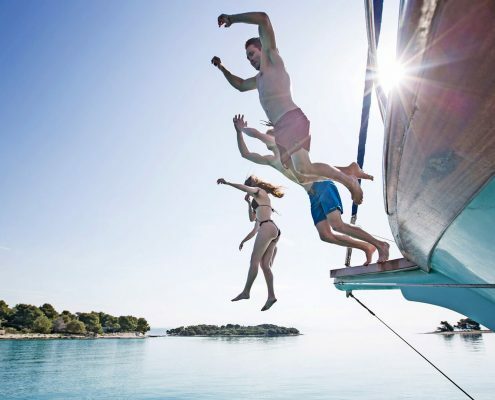 If you plan in advance you will avoid stress and problems and have an amazing time in Croatia since there is something for everyone there. b) Another super important thing is the crew that can either make or break your holiday experience. Picking the right crew is more important even than finding a dream gulet. Family Turkey cruise that will keep your kids amused! 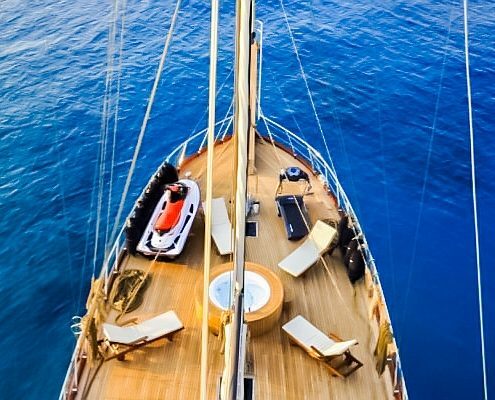 Tips and tricks – What To Know About Booking a Gulet Cruise?